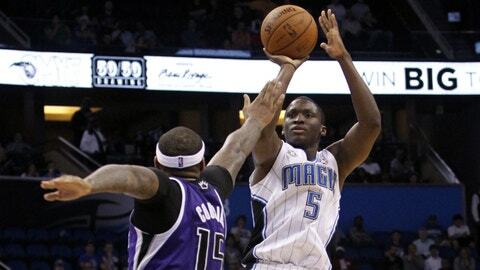 Rookie Victor Oladipo had started 16 consecutive games at guard until Saturday night against the Kings. FOXSportsFlorida.com checks in with studio analyst Brian Hill to get the latest on the Magic. FOX SPORTS FLORIDA: After missing close to two months, how long is it going to take for Tobias Harris to completely regain his rhythm? BRIAN HILL: I don’t know that you can put an exact time frame on it. You can be in the gym, and you can work on your shot and all your individual moves and everything else. It’s not the same as actually playing in a game and taking the contact and getting your timing and your rhythm with somebody defending you. It’s going to take him several games at least for him to get back to where he’d like to be. FSFla: Were the games against Chicago and Utah, where the Magic were held to 83 and 82 points, symptomatic of a team missing several key players recently like Arron Afflalo and Nikola Vucevic? BH: They’ve played without Tobias for a long time, so I think they established themselves offensively. Missing Afflalo for a game — anytime you have your leading scorer out, you have to have other people step up. But sometimes it’s a little harder for them to step up because a key player is off the floor. If that key player draws defensive attention, it makes it easier for the other players on the floor. When that guy is not on the floor, now everybody can concentrate more on just stopping their guy. In the case of the Utah game, Nik and Big Baby (Glen Davis) and (Victor) Oladipo didn’t have good offensive games in terms of field-goal percentage. So it makes for a long night. FSFla: Oladipo had started 16 consecutive games at a guard spot until Saturday night. How do you evaluate the job he and Jameer Nelson have done of meshing together? BH: I think they play very well together. Whether Jameer is on the ball or Victor is on the ball, I don’t think it really matters because Jameer can sometimes be a little bit more effective coming off screens and getting shots that way. But Oladipo’s greatest asset right now is his on-ball defense and his ability to attack the rim to get to the basket. He has a great change of pace. That’s what he’s best at right now — attacking the rim. His shooting will get better the longer the season goes on. Shooting usually improves over time. It’s his energy, his defense (that stand out). He rebounds the ball from his position. He gets a couple of steals per game. I think he’s having a very good all-around year. FSFla: Is there one reason you can pinpoint as to why Maurice Harkless is struggling in his second season with the Magic? BH: I really can’t. Unless you see somebody in practice every day, it would be hard for me to say why. I don’t really have a feel for his work habits and everything else. FSFla: So him playing around 15 minutes a game off the bench isn’t sufficient grounds? BH: That’s not a big enough sample of work to say why he doesn’t play. He’s young. He’s athletic. If he’s a hard worker and has a good attitude, then he’s probably going to be a good player for the Magic. Other than that, it’s hard to make an assessment on a guy when you don’t see him every day. BH: Obviously you would rather be home with your family and celebrating Christmas like everybody else does. But it is somewhat of an honor to be playing on Christmas Day because there are only a few games. And it usually means you have a good team because those are the only teams that play on Christmas Day. It’s part of the job. It comes with the territory. And you make adjustments, whether you have to celebrate Christmas Eve or you have a little window on Christmas Day to celebrate. I was so used to it from years in college, either traveling or playing, and in the NBA. Your family understands. It’s a privilege to coach in the NBA. So you certainly don’t complain about having to work on Christmas Day when there are probably a million other guys out there who would like to trade places with you.